What lies ahead for TV technology? Roll up televisions, better access to Apple services and even bigger screens could all be in the offing according to the world’s biggest tech show. The Consumer Electronics Show, which takes place every January, has been giving an insight into what people across the world can expect from tech gadgets. Television is always a firm favourite being one of the most popular technology items on the market. So what can we expect to see happen to our screens in the years to come? The ambitious roll-up television bought to the CES show by LG last year is a step closer to being a reality in homes as the creation is now being made for consumers and is due to go on the market later this year. This could certainly solve some issues on where and when to watch the TV if you can just roll it up and take it with you! Size remains a major theme when it comes to television as viewers seek a cinema-style experience from the comfort of their own homes. All of the major television manufacturers had large-scale screens on show ranging from 75in to 219in in size – and boasting maximum spec visuals. LG again stole the limelight with its Organic LED (OLED) technology that can be transparent and featured on a screen that doubled as the speaker with sound co-ordinated to movement. Samsung went biggest of all at the show, creating ‘The Wall’ a whopping 219-inch screen, made up of smaller modular screens. Picture quality continues to be a key focus with more options being rolled out for 8k television and a lot of behind the scenes work to develop LED technology that delivers pinpoint accuracy and a real depth of colour. While 8k televisions and roll-up screens are now within the grasp of some wealthier tech fans, there is good news for the wider television community too. 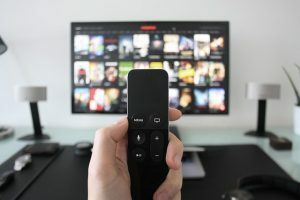 The show saw the announcement that Samsung would be adding iTunes to its television sets from Spring this year, which will give viewers even more choice when it comes to downloading videos and TV shows. For advice on improving your picture quality with a new aerial or for help installing a new television contact Aerial Services.